As we celebrate Constitution and Citizenship Day, we do well to reflect upon Franklin’s poignant words. They reflect something fundamental about the way our Founders understood the Constitution. Mainly, that the perpetuation of our republic depends directly on the people. For Benjamin Franklin, 1787 was not the first sweltering summer he spent at Independence Hall. He was there in 1776 as a member of the Second Continental Congress, which adopted the Declaration of Independence, telling the world that they intended to form a government like no one had ever seen before. Rather than placing power in the hands of kings and tyrants, this new government would recognize that power flows from the people and that rights come from our Creator. This government would be based on the essential truth that all men are created equal and are endowed with natural rights, including life, liberty, and the pursuit of happiness. It does this not by declaring those rights—the Bill of Rights came later—but by establishing a government of enumerated powers with the consent of the people. Since the Founders understood that all power flows from the people, they knew that the only legitimate powers of government must necessarily come from the people. Any power not enumerated to the federal government in the Constitution therefore remains with the people or the states. Given this, it is clear why the people are at the heart of our republic. Many think of today as “Constitution Day,” but in fact, it is officially, “Constitution and Citizenship Day.” It is fitting that we celebrate and reflect on these two together, because of the vital link that citizens hold with the Constitution. Power flows from the people, but so does responsibility. Every right of the people comes with a corresponding duty. One of the primary responsibilities citizens have is to engage and keep a watchful eye on their government. Citizens must ensure that their rights and interests are protected, and in doing so ensure that the powers of government do not expand beyond those delegated to it by the U.S. and state constitutions. Elections should not be the only point of contact that citizens have with their government. The most important time for citizens to engage with their government is actually in between elections. During this time, citizens can think about the issues of the day and guide policy discussions at home, in Columbus, and in Washington. Only by engaging in this process can citizens understand and judge the work of their elected officials, so that they can make an informed decision on Election Day. As you celebrate Constitution and Citizenship Day, I encourage you to learn about what your elected officials are doing. For example, I recently announced the Campus Free Speech Act, a bill to ensure that Ohio’s public universities protect free speech on their campuses to the fullest extent possible. Reflect on how you can help to guide us and to solve the difficult issues our communities face today. And most importantly, I urge you to continue to fight for and stand for our American constitutional republic. As your state representative, I work for you. Your input is vital for me to do my job well. Please feel free to contact me at (614) 644-6265 or rep87@ohiohouse.gov to let me know your thoughts. 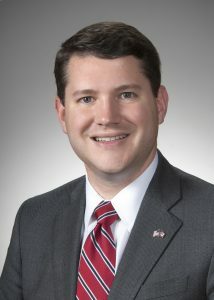 State Representative Wesley A. Goodman (R-Cardington) represents the 87th House District, covering all of Crawford, Morrow, and Wyandot counties, and portions of Marion and Seneca counties. You can find more information about and contact Goodman by clicking here. The author of these guest columns are described within the column. They are the opinion of the author and do not necessarily reflect the opinions of the staff and owners of Marion Online.